Winter is time to harvst many types of citrus like navel oranges, grapefruit, imperial mandarins, tangellos and my favorite limes. 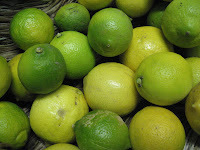 The Tahitian limes are just delicious at this time of the year. 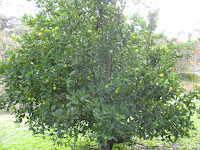 They have such a vast range of uses savory, sweet, soothing winter drinks, lime liqueur (like limoncello but better) prepared now for summer evenings on the veranda. 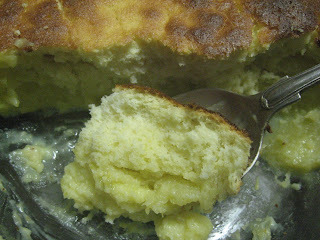 At this time of the year one of my favorites is lime pudding, its light and refreshing and can be served hot or cold. Finely grated rind and juice of 4 or 6 limes depending on size. Beat egg yolks and lime rind together until light. Gradually add sugar and lime juice beating until fluffy. Add melted butter. Gently stir in sifted flour and milk. Beat egg whites with salt until they form stiff peaks. Using a large metal spoon, lightly fold lemon mixture into the beaten egg whites. Pour mixture into a buttered baking dish and bake in a moderate oven (180 C) for 35 - 40 minutes or until it feels springy to touch and a golden colour.